HyperGear Beast XL shatters expectations, providing massive studio-quality sound with deeper bass levels than you'd ever expect from a portable wireless speaker. Do everything from stream your music to take hands-free calls from any Portable Wireless Bluetooth-enabled audio device. This fully loaded 30-watt speaker is engineered for superior performance with 5 Dynamic Drivers, 2 Passive Bass Radiators, 2 Acoustic Tweeters, 1 Powerful Subwoofer, and Anti-Distortion Circuitry. Enjoy the freedom of wireless living! With 16 hours of playtime on a single charge, you'll never miss a call or a beat! 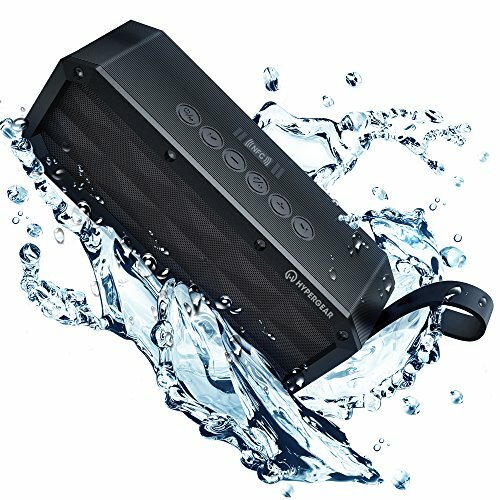 Thanks to a rugged waterproof IPX6 shock, dust, splash, and weather-proof exterior, this compact sound system is perfectly portable and always ready to bring party-level volumes to any adventure. Whether you rock it indoors or outdoors, this speaker is built brick-solid to Let your Music Break Free! If you have any questions about this product by HYPERGEAR, contact us by completing and submitting the form below. If you are looking for a specif part number, please include it with your message.